Bamboo is a quick-growing grass that makes a great choice for towels. Organic bamboo towels might not have made it to your local linen store yet, but they are a big trend that will only continue to grow in popularity. For those who haven't experienced bamboo fabric before, the idea can be a little strange. 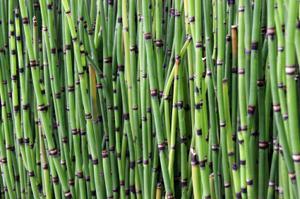 Bamboo is a grass that grows incredibly quickly and is one of the most renewable fiber sources on the planet. To make bamboo into fabric, it is pulped, and the fibers are spun together to make the fabric. The resulting product takes dye well and can be made just about any color. There are some qualities inherent in bamboo fabric that make it a particularly good choice for organic bamboo towels. First, bamboo can easily absorb a lot of water, which means you dry off quickly. It is also incredibly soft and luxurious. Bamboo is naturally antibacterial, which makes it a good choice for the bathroom. They are also machine washable and easy to care for. Because organic bamboo towels are not widely available in stores, your best bet might be shopping online. If you happen to have a luxury linen store where you live, however, you may be able to shop for these towels in person. EcoBathroom sells sets of bamboo towels that include a bath towel, a hand towel and a washcloth. They are available in four colors, including a natural color that contains no dye. These are 100 percent bamboo. The British shop The Natural Store has a cute organic bamboo hooded bath towel for babies that's percent for the eco-conscious mother. Bamboo towels are relatively sturdy and can be washed in the washing machine. Some manufacturers recommend using the gentle cycle to keep your towels looking good as long as possible. Check the label before you throw them in the wash. Sometimes you might notice loose threads on your towels. Just trim them away and keep using the towel as usual. This is a natural thing that happens with bamboo fiber and does not indicate that you've purchased a low-quality product. The standards for certification of organic linens are really non-existent. The individual products used in a piece might be organic, but the production methods could still involve chemical dyes and synthetic processing. The rules are different in different countries as well. If you're shopping the United States, check websites for the seal of the Organic Trade Association, a group that is seeking standards for calling clothing and linens organic. Or, check their website for more companies to contact. If the seller's website doesn't contain any information about whether the product is certified organic, don't hesitate to contact their customer service department and ask. If you are truly concerned about buying organic products, you might have to do a little homework. In the end, however, you can rest assured that you have chosen the best products for your home, your family and your planet. Vote with your pocketbook and let manufacturers know that you want organically produced items that you can believe in.